For US state-funded universities, see State university system. For Texas residential institutions, see Texas state supported living centers. For correctional facilities for juveniles, see Youth detention center. State schools (also known as public schools outside of England and Wales[note 1]) generally refer to primary or secondary schools mandated for or offered to all children without charge, funded in whole or in part by taxation. The term may also refer to public institutions of post-secondary education. State education includes basic education, kindergarten to twelfth grade, also referred to as primary and secondary education, as well as post-secondary educational institutions such as universities, colleges, and technical schools funded and overseen by government rather than private entities. State education is inclusive, both in its treatment of students and in that enfranchisement for the government of public education is as broad as for government generally. It is often organized and operated to be a deliberate model of the civil community in which it functions. Although typically provided to groups of students in classrooms in a central school, it may be provided in-home, employing visiting teachers, and/or supervising teachers. It can also be provided in non-school, non-home settings, such as shopping mall space. State education is generally available to all. In most countries, it is compulsory for children to attend school up to a certain age, but the option of attending private school is open to many. In the case of private schooling, schools operate independently of the state and generally defray their costs (or even make a profit) by charging parents tuition fees. The funding for state schools, on the other hand, is provided by tax revenues, so that even individuals who do not attend school (or whose dependents do not attend school) help to ensure that society is educated. In poverty stricken societies, authorities are often lax on compulsory school attendance because child labour is exploited. It is these same children whose income-securing labor cannot be forfeited to allow for school attendance. The term "public education" when applied to state schools is not synonymous with the term "publicly funded education". Government may make a public policy decision that it wants to have some financial resources distributed in support of, and it may want to have some control over, the provision of private education. Grants-in-aid of private schools and vouchers systems provide examples of publicly funded private education. Conversely, a state school (including one run by a school district) may rely heavily on private funding such as high fees or private donations and still be considered state by virtue of governmental ownership and control. testing and standards provided by government. In some countries (such as Germany), private associations or churches can operate schools according to their own principles, as long as they comply with certain state requirements. When these specific requirements are met, especially in the area of the school curriculum, the schools will qualify to receive state funding. They are then treated financially and for accreditation purposes as part of the state education system, even though they make decisions about hiring and school policy (not hiring atheists, for example), which the state might not make itself. Proponents of state education assert it to be necessary because of the need in modern society for people who are capable of reading, writing, and doing basic mathematics. However, some libertarians argue that education is best left to the private sector; in addition, advocates of alternative forms of education such as unschooling argue that these same skills can be achieved without subjecting children to state-run compulsory schooling. In most industrialized countries, these views are distinctly in the minority. Government schools (also known as public schools) are free to attend for Australian citizens and permanent residents, whereas independent schools usually charge attendance fees. They can be divided into two categories: open and selective schools. The open schools accept all students from their government-defined catchment areas. Government schools educate approximately 65% of Australian students, with approximately 34% in Catholic and independent schools. Regardless of whether a school is part of the Government or independent systems, they are required to adhere to the same curriculum frameworks of their state or territory. The curriculum framework however provides for some flexibility in the syllabus, so that subjects such as religious education can be taught. Most school students wear uniforms. Public or Government funded schools are found throughout Bangladesh. These schools mostly teach students from Year 1 to 10, with examinations for students in years 5, 8, and 10. All public schools follow the National Board Curriculum. Many children, especially girls, drop out of school after completing the 5th Year in remote areas. In larger cities such as Dhaka, however, this is fairly uncommon. Many good public schools conduct an entrance exam, although most public schools in the villages and small towns usually do not. Public schools are often the only option for parents and children in rural areas, but there are large numbers of private schools in Dhaka and Chittagong. Many Bangladeshi private schools teach their students in English and follow curricula from overseas, but in public schools lessons are taught in Bengali. Per the Canadian constitution, public-school education in Canada is a provincial responsibility and, as such, there are many variations among the provinces. Junior kindergarten (or equivalent) exists as an official program in only Ontario and Quebec while kindergarten (or equivalent) is available in every province, but provincial funding and the level of hours provided varies widely. Starting at grade one, at about age six, there is universal Crown-funded access up to grade twelve (or equivalent). Schools are generally divided into elementary schools (kindergarten to Grade 6), junior high schools (Grades 7 to 9), and high schools (Grades 10 to 12). However, in many areas middle schools are also provided and in some schools, particularly in rural areas, the elementary and middle levels can be combined into one school. In 2003, Grade 13 (also known as the Ontario Academic Credit or "OAC" year) was eliminated in Ontario; it had previously been required only for students who intended to go on to university. Children are required to attend school until the age of sixteen in most provinces, while students in Ontario and New Brunswick must attend schools until the age of eighteen. Some Canadian provinces offer segregated-by-religious-choice, but nonetheless Crown-funded and Crown-regulated, religiously based education. In Ontario, for example, Roman Catholic schools are known as "Catholic school" or "Separate school", not "Public school", although these are, by definition, no less "public" than their secular counterparts. In the PRC, state schools are funded and administered by the education sector within the government. Although some, especially high schools, have started to charge a fair portion of parents of students an additional tuition fee, due to the increased places offered by the schools in recent years. Top state schools are often very selective, however. Students who miss their entrance requirement may still gain places if they meet a relatively lower requirement and their parents are willing to pay for the additional fees. Some parents appreciate the idea as they may send their children to good schools even though they may not be academically qualified, while others believe that it is not fair for someone who has a background of poverty. The Danish School system is supported today by tax-based governmental and municipal funding from day care through primary and secondary education to higher education and there are no tuition fees for regular students in public schools and universities. The Danish public primary schools, covering the entire period of compulsory education, are called folkeskoler (literally 'people's schools' or 'public schools'). The Folkeskole consists of a pre-school class (mandatory since 2009), the 9-year obligatory course and a voluntary 11th year. It thus caters for pupils aged 6 to 17. It is also possible for parents to send their children to various kinds of private schools. These schools also receive government funding, although they are not public. In addition to this funding, these schools may charge a fee from the parents. Primary Schooling in France is mandatory as of age 6, the first year of primary school. Many parents start sending their children earlier though, around age 3 as kindergarten classes (maternelle) are usually affiliated to a borough's (commune) primary school. Some even start earlier at age 2 in pré-maternelle or garderie class, which is essentially a daycare facility. The baccalauréat (also known as bac) is the end-of-lycée diploma students sit for in order to enter university, a Classe Préparatoire aux Grandes Écoles, or professional life. The term baccalauréat refers to the diploma and the examinations themselves. It is comparable to British A-Levels, American SATs, the Irish Leaving Certificate and German Abitur. Most students sit for the baccalauréat général which is divided into 3 streams of study, called séries. The série scientifique (S) is concerned with mathematics and natural sciences, the série économique et sociale (ES) with economics and social sciences, and the série littéraire (L) focuses on French and foreign languages and philosophy. A striking trait of higher education in France, compared to other countries such as the United States, is the small size and multiplicity of establishments, each specialized in a more or less broad spectrum of disciplines. A middle-sized French city, such as Grenoble or Nancy, may have 2 or 3 universities (for instance: science / humanities), and also a number of engineering and other specialized higher education establishments. For instance, in Paris and suburbs, there are 13 universities, most of which are specialized on one area or the other, and a large number of smaller institutions. 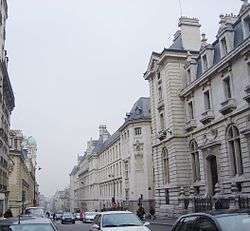 The Grandes écoles of France are higher education establishments outside the mainstream framework of the public universities. They are generally focused on a single subject area, such as engineering, have a moderate size, and are often quite (sometimes extremely) selective in their admission of students. They are widely regarded as prestigious, and traditionally have produced most of France's scientists and executives. Education in Germany is provided to a large extent by the government, with control coming from state level, (Länder) and funding coming from two levels: federal and state. Curricula, funding, teaching, and other policies are set through the respective state's ministry of education. Decisions about the acknowledgment of private schools (the German equivalent to accreditation in the US) are also made by these ministries. However, public schools are automatically recognised, since these schools are supervised directly by the ministry of education bureaucracy. Kindergartens are not part of the German public school system. (Although the first kindergarten in the world was opened in 1840 by Friedrich Wilhelm August Fröbel in the German town of Bad Blankenburg, and the term Kindergarten is even a loanword from the German language). Article 7 Paragraph 6 of the German constitution (the Grundgesetz) abolished pre-school as part of the German school system. However, virtually all German kindergartens are public. They are either directly run by municipal governments, or contracted out, most often, to the two largest Christian churches in Germany. These municipal kindergartens are financed by taxes and progressive income-based customer fees, but are not considered part of the public school system. Gymnasium (high school) until 12th grade or 13th grade (with Abitur as exit exam, qualifying for admission to university). Gesamtschule (comprehensive school) with all the options of the three "tracks" above. A Gesamtschule largely corresponds to an American high school. However, it offers the same school leaving certificates as the other three types of German secondary schools – the Hauptschulabschluss (school leaving certificate of a Hauptschule after 9th Grade or in Berlin and North Rhine-Westphalia after 10th Grade), the Realschulabschluss, also called Mittlere Reife, (school leaving certificate of a Realschule after 10th Grade) and Abitur, also called Hochschulreife, after 13th or seldom after 12th Grade. Students who graduate from Hauptschule or Realschule continue their schooling at a vocational school until they have full job qualifications. This type of German school, the Berufsschule, is generally an upper-secondary public vocational school, controlled by the German federal government. It is part of Germany's dual education system. Students who graduate from a vocational school and students who graduate with good GPA from a Realschule can continue their schooling at another type of German public secondary school, the Fachoberschule, a vocational high school. The school leaving exam of this type of school, the Fachhochschulreife, enables the graduate to start studying at a Fachhochschule (polytechnic), and in Hesse also at a university within the state. The Abitur from a Gesamtschule or Gymnasium enables the graduate to start studying at a polytechnic or at a university in all states of Germany. A number of schools for mature students exists. Schools such as the Abendrealschule serve students that are headed for the Mittlere Reife. Schools such as the Aufbaugymnasium or the Abendgymnasium prepare students for college and finish with the Abitur. Those schools are usually free of charge. In Germany, most institutions of higher education are subsidized by German states and are therefore also referred to as staatliche Hochschulen. (public universities) In most German states, admission to public universities is still cheap, about two hundred Euro per semester. In 2005, many states introduced additional fees of 500 Euro per semester to achieve a better teaching-quality; however, all of these states (except Lower Saxony, which will follow in 2014/15) have abolished tuition fees as of autumn 2013. Nevertheless, additional fees for guest or graduate students are charged by many universities. In Hong Kong the term government schools is used for free schools funded by the government. There are also subsidized schools (which are the majority in Hong Kong and many of which are run by religious organizations), "Direct Subsidy Scheme" schools, private schools and international schools in Hong Kong. 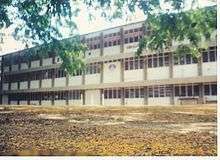 Some schools are international schools, which are not subsidized by the government. During British rule, a number of state higher education establishments were set up (such as Universities in Madras, Calcutta, and Bombay), but little was done by the British in terms of primary and secondary schooling. Other indigenous forms of education are being revived in various ways across India. According to current estimates, 80% of all Indian schools are government schools making the government the major provider of education. However, because of the poor quality of public education, 27% of Indian children are privately educated. According to some research, private schools often provide superior educational results at a fraction of the unit cost of government schools. There are a large number of students per class in government schools so many teachers cannot give a specific period of individual to a particular student. In private schools the number of students per classroom are usually fewer, so the teacher can give more individual attention to each student. That is the reason that private school results are often better than those achieved by government schools. Education in India is provided by the public sector as well as the private sector, with control and funding coming from three levels: federal, state, and local. The Nalanda University was the oldest university-system of education in the world. Western education became ingrained into Indian society with the establishment of the British Raj. In Ireland, post-primary education comprises secondary, community and comprehensive schools, as well as community colleges (formerly vocational schools). Secondary schools are privately owned and managed. Community colleges are state-established and administered by Education and Training Boards (ETBs), while community and comprehensive schools are managed by Boards of Management of differing compositions. Privately owned and managed secondary schools receive a direct grant from the state, and are subdivided into fee-paying and non fee-paying schools. The vast majority of these schools are operated by religious organisations, primarily the Catholic Church and the Church of Ireland. The charging of fees is a decision of the individual school. The Irish Constitution requires the State to "endeavour to supplement and give reasonable aid to private and corporate educational initiative, and, when the public good requires it, provide other educational facilities or institutions with due regard, however, for the rights of parents, especially in the matter of religious and moral formation." In practice, most people are educated by Catholic institutions as there are few alternatives in much of the country. Non fee-paying secondary schools are usually considered to be public or state schools, while private school and fee-paying schools are considered synonymous. This is colloquial and not technically accurate. All schools which are provided for by the State, including privately run and fee-paying secondary schools, teach the national curriculum. All students are expected to take the standardised Junior Certificate examination after three years. An optional non-academic Transition Year is provided by most but not all schools immediately following the Junior Certificate. Students subsequently take one of three Leaving Certificate programmes: the traditional Leaving Certificate, the Leaving Certificate Vocational Programme (LCVP) or the Leaving Certificate Applied (LCA). The vast majority of students in Ireland take the traditional Leaving Certificate. Both the traditional Leaving Certificate and the Leaving Certificate Vocational Programme can lead to third-level education, with LCVP more focused on practical skills. In South Korea, education in public schools (1-12) is compulsory with the exception of kindergarten. All aspects of public education are the responsibility of the Ministry of Education, which executes administration of schools, allocation of funding, certification of teachers and schools, and curriculum development with standardized textbooks across the country. In the year 2000, South Korea spent 4.2% of its GDP in education. As of 2007 UN Education Index, South Korea is ranked 8th in the world. Chio Min Secondary School (government-sponsored schools) in Kulim, Kedah, Malaysia. Education in Malaysia is overseen by two government ministries: the Ministry of Education for matters up to the secondary level, and the Ministry of Higher Education for tertiary education. Although education is the responsibility of the federal government, each state has an Education Department to help coordinate educational matters in their respective states. The main legislation governing education is the Education Act of 1996. Education may be obtained from government-sponsored schools, private schools, or through homeschooling. By law, primary education is compulsory. As in other Asian countries such as Singapore and China, standardised tests are a common feature. Public schools in the Philippines are run by the Department of Education. Some public schools collect miscellaneous school fees for the better utilization of school extra-curricular activities and/or for improving school equipment and services. Education in Argentina is a responsibility shared by the national government, the provinces and federal district and private institutions, though basic guidelines have historically been set by the Ministry of Education. Closely associated in Argentina with President Domingo Sarmiento's assertion that "the sovereign should be educated" ("sovereign" referring to the people), education has been extended nearly universally and its maintenance remains central to political and cultural debate. Even though education at all levels, including universities, has always been free, there is a large number of private schools and universities. Argentina's higher education managed to reach worldwide levels of excellence in the 1960s. Up to 2013 Argentina educated five Nobel Prize winners, three in the sciences: Luis Federico Leloir, Bernardo Houssay and César Milstein and two in peace: Carlos Saavedra Lamas and Adolfo Pérez Esquivel, the highest number in Latin America surpassing countries economically more developed and populated as Ireland or Spain. In addition, as of 2010, Argentines are the only Latin Americans to have ever been honoured with a Rolf Schock Prize. Education in Argentina has four levels and two different systems: initial level (kindergarten, educación inicial), primary level (educación primaria), secondary level (educación secundaria) and tertiary level (educación superior). Secondary School in the pampas city of Bragado. Argentina's secondary schools belong to a provincial system. EP I: 1st, 2nd and 3rd school years EP II: 4th, 5th and 6th school years ES I: 1st, 2nd and 3rd school years ES II: 4th, 5th and 6th school years In the rest of the country EP comprises grades first to seventh (the traditional system, established by Argentine law 1420/1884). ES comprises grades first to fifth (the traditional system, in use throughout the 20th century). In both systems EP is mandatory to all students, as well as secondary education, according to the National Educational Law established in 2011. The fourth stage is tertiary education, which includes both college and university education. Education is funded by tax payers at all levels except for the majority of graduate studies. There are many private school institutions in the primary, secondary and university levels. Around 11.4 million people were enrolled in formal education of some kind in 2005. One important aspect is that Public universities at Tertiary Education level and at University level are tuition-free and open to anyone. Although it is not required to pay any kind of fee at universities, hidden costs of education, like transportation and materials, are often neglected and a lack of a well-developed and widespread scholarship system makes it hard for students from low-income families to enroll in public universities: for each eight students from the 20% upper-income class, there is only one student from the 20% lower-income class. In contrast, post-graduate education requires some form of funding and it is generally not free. Additionally, financial pressure to freshman college students force them to join the work force before graduation, thus it is very common for young students to have full-time jobs and at the same time study at the University. This is considered beneficial because when the students graduate they already have working experience, though this could also be one of the causes of the high ratio of dropouts. The University of Buenos Aires Law School. Argentina does not have a standard and common system of examination after high school, thus admission to universities is strictly defined by each university. Moreover, a steady degradation in primary and secondary education created a huge difference between the required level to enter a university and the level achieved by the high school students. Some universities like University of Buenos Aires cope with this issue by creating a 1-year shared program called CBC that students need to complete in order to join the university. This acts like some sort of admittance "filter". In some countries, such as Brazil and Mexico, the term "public schools" (escuelas públicas in Spanish, escolas públicas in Portuguese) is used for educational institutions owned by the federal, state, or city governments which do not charge tuition. Such schools exist in all levels of education, from the very beginning through post-secondary studies. Mexico has nine years of free and compulsory primary and secondary education. The Church of Scotland was established in 1560, during the Protestant Reformation period as the official state religion in Scotland, and in the following year it set out to provide a school in every parish controlled by the local kirk-session, with education to be provided free to the poor, and the expectation that church pressure would ensure that all children took part. In the year of 1633 the Parliament of Scotland introduced local taxation to fund this provision. Schooling was not free, but the tax support kept fees low, and the church and charity funded poorer students. This had considerable success, but by the late 18th century the physical extent of some parishes and population growth in others led to an increasing role for "adventure schools" funded from fees and for schools funded by religious charities, initially Protestant and later Roman Catholic. In 1872 education for all children aged 5 to 13 was made compulsory with "public schools" (in the Scots meaning of schools for the general public) under local school boards. The leaving age was raised to 14 in 1883, and a Leaving Certificate Examination was introduced in 1888 to set national standards for secondary education. School fees were ended in 1890. The Scottish Education Department ran the system centrally, with local authorities running the schools with considerable autonomy. In 1999, following devolution from the Parliament of the United Kingdom to the new Scottish Parliament, central organisation of education was taken over by departments of the Scottish Executive, with running the schools coming under unitary authority districts. 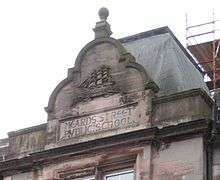 Pediment above entrance showing name of Mearns Street Public School, built for Greenock Burgh School Board. In Scotland, the term public school, in official use since 1872, traditionally means "a state-controlled school run by the local burgh or county education authority, generally non-fee-paying and supported by contributions from local and national taxation". Largely due to the earlier introduction of state-administered universal education in Scotland and opposed to the rest of the United Kingdom, the term became associated with state schools. The designation was incorporated into the name of many of these older publicly run institutions. Children in Scottish state schools (or public schools) typically start primary school, or attend a junior school, aged between four and a half and five and a half depending on when the child's birthday falls. Children born between March and August would start school at the age of five years and those born between September and February start school at age four-and-a-half. Pupils remain at primary school for seven years completing Primary One to Seven. Then aged eleven or twelve, pupils start secondary school for a compulsory period of four years, with a final two years thereafter being optional. Pupils take Standard Grade examinations at the age of fifteen/sixteen, sometimes earlier, most often for up to eight subjects. These include compulsory exams in English, mathematics, a foreign language, a science subject and a social subject. It is now a requirement of the Scottish Government that all pupils have two hours of physical education a week. Each school may arrange these compulsory requirements in different combinations. The minimum school leaving age is generally sixteen, after completion of Standard Grade examinations. Pupils who continue their school education after the age of sixteen, may choose to study for Access, Intermediate or Higher Grade and Advanced Higher exams. The Curriculum for Excellence was introduced to secondary schools in session 2012/2013. The assessment of pupils' attainment will change, with 'National' qualifications replacing most Standard Grade and Intermediate Grade qualifications. In South Africa, a state school or government school refers to a school that is state-controlled. These are officially called public schools according to the South African Schools Act of 1996, but it is a term that is not used colloquially. The Act recognised two categories of schools: public and independent. Independent schools include all private schools and schools that are privately governed. Independent schools with low tuition fees are state-aided and receive a subsidy on a sliding-scale. Traditional private schools that charge high fees receive no state subsidy. State schools are all state-owned, including section 21 schools (formerly referred to as Model C or semi-private schools) that have a governing body and a degree of budget autonomy, as these are still fully owned and accountable to the state. Most of the schools in Sri Lanka are maintained by the government as a part of the free education. With the establishment of the provincial council system in the 1980s the central government handed control of most schools to local governments. However the old schools which had been around since the colonial times were retained by the central government, thus creating three types of government schools: National Schools, Provincial Schools, and Piriven. National Schools come under the direct control of the Ministry of Education therefore have direct funding from the ministry. Provincial Schools consists of the vast majority of schools in Sri Lanka which are funded and controlled by the local governments. Piriven are monastic college (similar to a seminary) for the education of Buddhist priests. These have been the centers of secondary and higher education in ancient times for lay people as well. Today these are funded and maintained by the Ministry of Education. Swedish state schools are funded by tax money. This goes for both primary and secondary school (Swedish: grundskola), high school (Swedish: gymnasium) and universities. When studying at a university, however, you might have to pay for accommodation and literature. There are private schools as well who also receive funding from the government, but they may charge a fee from the parents. Compulsory education starts at seven years of age, with an optional year in förskola (pre-school). The Swedish primary school is split into three parts; Lågstadiet – “the low stage”, which covers grades 1 to 3. This is where you learn the basics of the three main subjects – in Swedish called kärnämnen – Swedish, English and mathematics. It also includes some natural science. Mellanstadiet – “the middle stage”, which covers grades 4 to 6, introduces the children to more detailed subjects. Woodwork and needlework, social and domestic science, and even a second, foreign language in grade 6, a B-språk (B-language). The languages available are usually French, Spanish or German depending on the school. Högstadiet, “the high stage”, is the last stage of the compulsory education, between grades 7 and 9. This is when studies get more in-depth and are taken to an international level. Swedish children take national exams at grades 3, 6 and 9. Children at grade 3 take these exams in two of the three main subjects: Swedish and mathematics. In grade 5 the exams extend to the third main subject, English, and in grade 9 the exams also extend to natural science, foreign languages, and one of the four subjects in "Samhällsorientering" (geography, history, religious studies, and civics). They first receive grades in grade 6. The grading system is letter-based, ranging from A-F, where F is the lowest grade and A is the highest. F means "not approved", while all other ratings above F mean "approved". There are only objectives for E, C and A; D means the person has met most (but not all) objectives for C, while B means the person has met most objectives for A. When applying to gymnasium (high schools) or universities, a meritvärde (“meritous point value”) is calculated. E is worth 10 points, D 12.5 points, C 15 points, and so on. Children not being approved in Swedish, English and mathematics will have to study at a special high school program called the “individual program”. Once they are approved, they may apply to an ordinary high school program. Swedes study at high school for three years, between the ages of 16 and 18. In the United Kingdom, the term "state school" refers to government-funded schools which provide education free of charge to pupils. The contrast to this are fee-paying schools, such as "independent (or private) schools" and "public schools". In England and Wales, the term "public school" is used to refer to fee-paying schools. "Public" as in they are open to anyone who can meet the fees, distinguished from religious schools which are open only to members of that religion. Some people call only the older fee-paying schools, "public schools" (for example, schools such as Eton College and Charterhouse School), while others use the term for any such school. In Scotland, where the educational system is completely different from the rest of UK, the Church of Scotland was established in 1560, during the Protestant Reformation period as the official state religion, and in the following year it set out to provide a school in every parish controlled by the local kirk-session, with education to be provided free to the poor, and the expectation that church pressure would ensure that all children took part. In the year of 1633 the Parliament of Scotland introduced local taxation to fund this provision. Schooling was not free, but the tax support kept fees low, and the church and charity funded poorer students. This had considerable success, but by the late 18th century the physical extent of some parishes and population growth in others led to an increasing role for "adventure schools" funded from fees and for schools funded by religious charities, initially Protestant and later Roman Catholic. In 1872 education for all children aged 5 to 13 was made compulsory with "public schools" (in the Scots meaning of schools for the general public) under local school boards. The leaving age was raised to 14 in 1883, and a Leaving Certificate Examination was introduced in 1888 to set national standards for secondary education. School fees were ended in 1890. The Scottish Education Department ran the system centrally, with local authorities running the schools with considerable autonomy. In 1999, following devolution from the Parliament of the United Kingdom to the new Scottish Parliament, central organisation of education was taken over by departments of the Scottish Executive, with running the schools coming under unitary authority districts. Children in Scottish state schools (or public schools) typically start primary school, or attend a junior school, aged between four and a half and five and a half depending on when the child's birthday falls. Children born between March and August would start school at the age of five years and those born between September and February start school at age four-and-a-half. Pupils remain at primary school for seven years completing Primary One to Seven. Then aged eleven or twelve, pupils start secondary school for a compulsory period of four years, with a final two years thereafter being optional. Pupils take Standard Grade examinations at the age of fifteen/sixteen, sometimes earlier, most often for up to eight subjects. These include compulsory exams in English, mathematics, a foreign language, a science subject and a social subject. It is now a requirement of the Scottish Government that all pupils have two hours of physical education a week. Each school may arrange these compulsory requirements in different combinations. The minimum school leaving age is generally sixteen, after completion of Standard Grade examinations. Pupils who continue their school education after the age of sixteen, may choose to study for Access, Intermediate or Higher Grade and Advanced Higher exams. The Curriculum for Excellence was introduced to secondary schools in session 2012/2013. The assessment of pupils' attainment will change, with 'National' qualifications replacing most Standard Grade and Intermediate Grade qualifications. The National Curriculum is followed in all local authority maintained schools in England, Northern Ireland and Wales. State schools in Wales, including Welsh-medium schools, are controlled by the Welsh Government. Academies, which are state schools, but not maintained by local authorities, have more freedom to adapt the National Curriculum. In Northern Ireland secondary-level schools are divided into grammar schools, secondary schools and Catholic-maintained schools, with an increasing number of Integrated schools. There are also a small number of voluntary Irish-language schools. Throughout education in the UK, the vast majority of state-funded schools are under the control of local councils (local education authorities in England and Wales, Department of Education in Northern Ireland), and are referred to in official literature as "maintained schools". The exceptions are a minority of secondary schools in England funded directly by central government, known as academies and City Technology Colleges. Some state schools, known as faith schools, have formal links with religious organisations, and are permitted to promote a particular religious ethos and to use faith criteria in their admissions. Some maintained schools are partially funded by religious or other charitable bodies; these are known as voluntary controlled schools, voluntary aided schools or foundation schools. The oldest state school in England is Beverley Grammar School, which was founded in 700 AD. In the United States, the term "state school" is colloquial for state university, a college or university in a state university system. The term "public school" is used for elementary, middle, and high schools which are funded and/or run by a governmental entity. The term "public school" is used in the United States to mean what other countries call "state school". "State school" is sometimes used in reference to state universities but is almost never used in reference to elementary and high schools. "Private school" generally refers to primary, secondary and tertiary educational institutions that are not government-owned. Elementary, middle, and high schools that are operated by a religious organization are commonly called "parochial schools." The role of the United States government in education is limited and indirect. Direct diction of education is a power reserved to the states under the Tenth Amendment to the United States Constitution (because the Constitution does not explicitly or implicitly give the federal government authority to regulate education). However, any public or private school that accepts educational funding from the United States government, including participation in collegiate federal financial aid programs (such as Pell Grants and Stafford Loans), by accepting those funds or participating in the particular federal program, subjects itself to federal jurisdiction to the extent of that participation. The United States Department of Education supervises the role of the federal government in education. Direct regulation of public, private and parochial schools in the United States is done by state and territorial governments (in Washington, DC, by the District Government). Broad regulation of public schools is typically accomplished through a state board of education and a state department of education. There is usually a state superintendent of schools, who is appointed or elected to coordinate the state department of education, the state board of education, and the state legislature itself. Statewide education policies are disseminated to school "districts" or their equivalents. These are associated with counties, or with groups of counties; but their boundaries are not necessarily coterminous with county boundaries. These intermediate school districts encompass many local school districts. The local school districts operate with their own local boards, which oversee operations of the individual schools within their jurisdiction. In most states, the county or regional "intermediate" school districts merely implement state education policy, and provide the channels through which a local district communicates with a state board of education, state superintendent and department of education. They do not establish county or regional policies of their own. Local school districts are administered by local school boards, which operate public elementary and high schools within their boundaries. Public schools are often funded by local taxpayers, and most school boards are elected. However, some states have adopted new funding models that are not dependent upon the local economy. 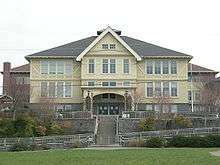 The Seward School, Seattle, Washington. Public schools are provided mainly by local governments. Curricula, funding, teaching, and other policies are set through locally elected school boards by jurisdiction over school districts. The school districts are special-purpose districts authorized by provisions of state law. Generally, state governments can and do set minimum standards relating to almost all activities of elementary and high schools, as well as funding and authorization to enact local school taxes to support the schools—primarily through real property taxes. The federal government funds aid to states and school districts that meet minimum federal standards. School accreditation decisions are made by voluntary regional associations. The first free public school in America was the Syms-Eaton Academy (1634) in Hampton, Virginia, while the first tax-supported public school in America was in Dedham, Massachusetts, founded by Rev. Ralph Wheelock. In the United States, 88% of students attend public schools, compared with 9% who attend parochial schools, 1% who attend private independent schools, and 2% who are home-schooled. Public school is normally split up into three stages: elementary school (kindergarten to 5th or 6th grade), middle ("intermediate" or junior high school) from 5th, 6th, or 7th grade to 8th or 9th grade, and high school (9th or 10th to 12th grade). The middle school format is increasingly common, in which the elementary school contains kindergarten or 1st grade through 5th or 6th grade and the Middle School contains 6th or 7th through 8th grade. In addition, some elementary schools are splitting into two levels, sometimes in separate buildings: elementary school (usually K-2) and intermediate (3-5). The K-8th format is also an emerging popular concept, in which students may attend only two schools for all of their K-12 education. Many charter schools feature the K-8 format in which all elementary grades are housed in one section of the school while the traditional junior high school aged students are housed in another section of the school. 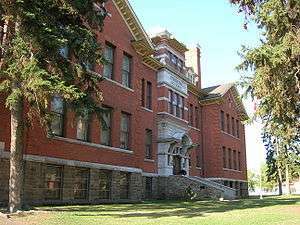 Some very small school districts, primarily in rural areas, still maintain a K-12 system in which all students are housed in a single school. A few 7-12 schools also exist. In the United States, institutions of higher education that are operated and subsidized by U.S. states are also referred to as "public." However, unlike public high schools, public universities charge tuition, though these fees are usually much lower than those charged by private universities, particularly for students who meet in-state residency criteria. Community colleges, state colleges, and state universities are examples of public institutions of higher education. In particular, many state universities are regarded as among the best institutions of higher education in the U.S., though usually they are surpassed in ranking by certain private universities and colleges, such as those of the Ivy League, which are often very expensive and extremely selective in the students they accept. In several states, the administrations of public universities are elected via the general electoral ballot. ↑ "School fees in Australia". Study in Australia. Archived from the original on 9 April 2011. Retrieved 9 July 2010. ↑ "Primary and Secondary Education". Year Book Australia. Australian Bureau of Statistics. 2008. Archived from the original on 2 July 2010. Retrieved 2 July 2010. ↑ "What schooling and training is there for my family and me?". Department of Immigration and Citizenship. Archived from the original on 15 April 2013. Retrieved 16 February 2010. ↑ "A special report on India: Creaking, groaning: Infrastructure is India's biggest handicap". The Economist. 11 December 2008. ↑ Geeta Gandhi Kingdon. "The progress of school education in India" (PDF). 1 2 3 "Post Primary Education". education.ie. ↑ "Constitution and education". citizensinformation.ie. ↑ Aaron Schrank. "A New Problem in Ireland: Where to Find a Non-Catholic School?". The Atlantic. 1 2 Scottish National Dictionary Archived September 14, 2011, at the Wayback Machine. 1 2 "Scotland's Curriculum For Excellence-An Introduction". BBC Scotland News. 16 August 2011. Retrieved 27 January 2013. ↑ "Home – BBC News". BBC News. ↑ In England and Wales, some independent schools for 13- to 18-year-olds are known for historical reasons as 'public schools'. Heller, Frank: Lessons from Maine: Education Vouchers for Students since 1873, Cato Institute, Sep. 10, 2001. Thattai, Deeptha: A History of Public Education in the United States. Steve Suitts, Southern Education Foundation. "Crisis of a New Majority: Low-Income Students in the South's Public Schools" Southern Spaces. April 16, 2008.